I learned a new term recently – “stress storm” Actually, I heard it used on the Dr. Phil Show. It makes perfect sense! When I explain it, you will know exactly what it is, and I bet you have them all the time. Here’s an example. Yesterday when I stopped by the assisted living, Mom was not having a good day. The good news was, she was cheerful, but she was quite confused and lethargic. She had some very good days last week, so I was particularly disappointed and disheartened. Was there some acute reason for the change? Or just the nature of the disease? I also noticed one of her eyes was quite red and had some dark “goop” in the corner. Uh-oh, she is prone to eye infections and it looked like we had another one. I approached the nurse on duty to check mom’s chart to see if we had a standing order for the antibiotic ointment or if we needed to call the doctor. She could not find any record of a such a an ointment. Grrrr. I KNEW we had used an ointment ! I recalled we had used it on at least two bouts of the infection. But it was the weekend, so nothing could be done at the time so I decided to further investigate on Monday. So on Monday as I was driving to the assisted living, I was worrying about what I would find when I arrived. Would mother be as confused as she was yesterday? Is she developing a UTI or some other acute illness? Would her private caregiver have arrived? How was her eye? And then I realized my breathing was quick, my adrenaline was rushing and my head was reeling. My stomach was jittery. I am sure my stress hormone, cortisol was elevated and maybe even my blood pressure! YEP, a “stress storm”!! But here is the thing…I didn’t really need to be that worked up. There are plenty of times, as a caregiver, that we must be ready to “fight or flight” – a sudden fall, an illness that comes on suddenly, or some other emergency. But I wasn’t in any kind of emergency situation. Yet, very often, my physical and emotional response seems to be elevated more than necessary….a stress storm! I am sure many of you experience the same thing – and it’s not good for us! That’s the kind of thing that will kill us! You’ve heard it and I preach it in my work with caregivers and in my public speaking. Caregivers are too stressed. Caregivers often get ill and cannot take care of their loved one. Caregivers need to take care of themselves! You know the drill. And in my view, it is this thing called “stress storms” rather than true catastrophic situations that will get us. Our minds and bodies, somehow get stuck in this vicious cycle…so we breathe quickly, our minds race, we may experience heart palpitations or if nothing else we THINK our heart is pounding…and what about when it happens in the middle of the night? Isn’t that the worst?? So, my good pal Dr Phil says that one way to calm a stress storm is to simply use deep breathing. OK Phil, so this morning, in the car, I tried it. When I realized I was having an unnecessary stress storm, I simply took a slow deep breath, in through my nose, counting to six. Then I slowly let it out with my mouth slightly open and again counted to six. And you know what? It worked. My mind was now on the counting and breathing, not on the forty seven things I had whirling in my mind. After a few more deep breathes, I really did start to feel more calm. The jittery feeling I had been feeling in my gut seemed to ease. I could really feel my body begin to calm down. 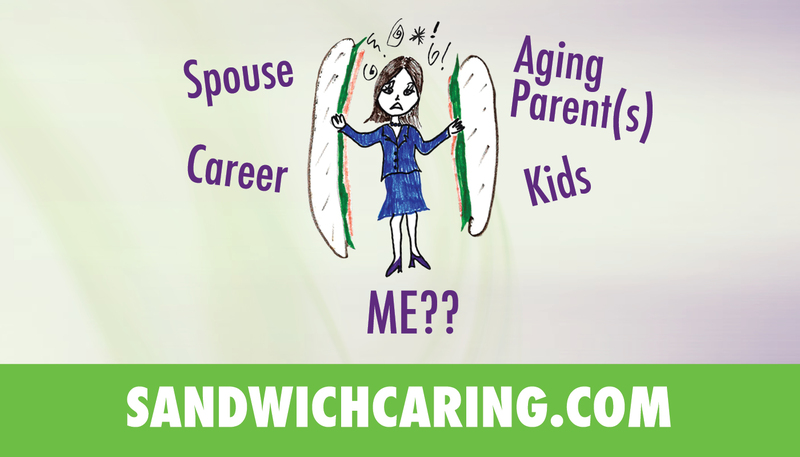 So, Sandwich Caregivers, I want you all to join my “Sandwich Deep Breathing Club” to combat those stress storms. I wish we didn’t have them…but until we can avoid them all together, let’s use this deep breathing to help us calm down from those nasty little storms that hit us. We need to save ourselves for the true tough situations that we are sure to face. In fact, I may do some envisioning as well. Maybe we could view these stress storms as little gremlins, who arrive just to work us up unnecessarily. While I am doing my deep breathing, I think I will visualize big boots just stamping those gremlins hard! All too often, you and I kick stomp ourselves, don’t we? “I should have been more patient with my Dad today.” ( stomp, stomp) or ” I should not have snapped at my mom.” (stomp stomp) or ” I have ignored my kids this week. I am such a bad mom!” (stomp, stomp). So while we are at it, let’s break that habit, too. Let’s make it those gremlins with their stress storms that we stomp. Let’s give ourselves a break! No more stomping ourselves! Ok – here we go…Breathe in through your nose – 1, 2, 3 , 4, 5, 6….now out – open your mouth a bit – 1,2,3,4,5,6 (Big boots, stomp stomp!) now in again……..
Keep it up! Breathing and stomping! ‘Til next time, take care of YOU! This entry was posted in caregiving, life challenges, parents, planning for the future, sandwichcaring on November 4, 2013 by janestory.